Unions claim services will be hit and jobs lost after health bosses on Teesside announced "huge" budget cuts of £40m over the next three years. 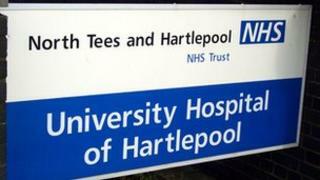 North Tees and Hartlepool NHS Foundation Trust is making £16m of cuts this year, followed by £14m in 2012/13 and £10m in 2013/14. The trust, which employs 5,500 staff, is hoping to avoid compulsory redundancies by reviewing its services. About 71% of its annual £265m budget is used to pay for staff. Mike Hill, from Unison, said: "These cuts are huge. It's shocking news to our members who work in the trust. "Staff are angry and they're also concerned, there's been no figures put on any of the job losses. "We appreciate the commitment to no compulsory redundancies and the strategy behind that, but at the end of the day you're looking at cuts of such magnitude that you can't guarantee that." The cuts are due to the annual budget staying flat for three years and not rising with inflation, as the government focuses health service funding into early prevention of diseases. To deal with the fixed budget, the trust said savings will have to be made to pay for rising energy bills, pay increments and the increased cost of drugs and medical equipment. One option the trust is considering is centralising some of its services in Stockton and Hartlepool into one site. It also aims to make further savings through pay restraint, maximising the use of new technology and the building of the new Wynyard Hospital. Trust Chief Executive Alan Foster said: "It will mean for some departments it will be one site or the other and people will get a better service as a result of that as it will amount to a quality improvement as well. "Clearly what we want to do is safeguard as many jobs as we can to protect front line services, but over time using technology, reducing the number of beds that we need, transferring services into the community, means we can reduce the number of jobs." Conservative MP for Stockton South, James Wharton, said: "This isn't money that is being taken away, this is money that is being moved and spent on different parts of the NHS with the goal of providing a better service to local people." The Trust will go through a public consultation period to discuss possible cuts.